Your little pup will leave your slippers alone when you give them their very own Slipper Dog Toy in Yellow! 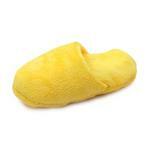 Keep your toes warm while your dog plays with their own Slipper Dog Toy in Yellow! This tiny version of a slipper is an adorable way to teach your dog to bring slippers to you. Customer service is always A+.